Musings: Informed from experimentation, setbacks, excellent feedback and successes from over a decade of coaching tens of CEO’s, Senior leaders and Business leaders from across industries, cultures and geographies in MNC’s, large enterprises and start-ups. 1. Setting expectations and contracting: This forms the foundation and guiding principles that set the frame in the coaching journey with a client. This is when I encourage coaches to invest a reasonable amount of time and focus before advancing to the next phase of actually understanding the context. It is imperative that the coach clearly calls out the bottle-necks/obstacles that could potentially sabotage the coaching journey. Do you as a coach put caveats like “Health warning” on cigarette packs? The presenting context for coaching might not always be the actual context. Invariably many hopes and concerns surface in the intake sessions after the contracting and it is recommended that a coach revisit the expectations and key success factors immediately after a couple of sessions and maybe again before finalizing the priorities and goals. In the absence of a sound contract and articulated scope of work the coaching is more like a topping at surface level without the core ingredients which garner exceptional return on investment. 2. Conscious evolution and congruence: How do you show up in the coaching space?. One of the most critical factor is a sound mental and emotional space of a coach. Does your energy energize and inspire the coachee? Do you as a coach invest in your own inner growth and outer appearance? How high is your self-awareness quotient? Who do you seek frequent feedback from? These are powerful reflective questions to ask yourself. As a coach one must be mindful to practice only if ones’ own space is clear and devoid of any stress caused by day to day challenges and things you are dealing with. When any two people or group of people are engaging, transference of energy between the parties affects the environment and energy levels of the individual, therefore a coach who is conscious of his/her energy is far more effective in keeping coachees motivated and inspired to attend sessions and engage deeply. I encourage coaches to postpone ongoing sessions if they are dealing with emotional issues caused by professional or personal events. Embracing vulnerability is seen as authentic and supports in building trust with the coachee. 3. Confidence to be authentic and candid by quality questioning – It pays to highlight what is ‘unacceptable’ in the coaching journey. Many coaches misinterpret the guideline of “Clients agenda” and make the mistake of focusing on pacing the coachee instead of being true to the essence of coaching by leading and then pacing. An extraordinary coach will review the organization’s and client’s agenda being presented against the backdrop of the political environment and dynamics in the client organization to look for congruence and alignment. If required a coach should be willing to challenge the expected desired outcomes by posing quality probing and provocative questions to the sponsor organization and key stakeholders. Confidence only comes with experience and a high degree of mindfulness. Example could be: Many a times the sponsor organization claims that managers (coachees) are free to reach out to the CEO who is always available, yet the manager happens to provide enough evidence that he/she has reached out several times in vain, then it is the coaches responsibility to highlight such behavior and share the feedback with concerned stakeholders. This is what I term as “Clients Agenda” (Coachee is the client. 4. Calibrating to the coachees world: The coachees internal and external world is very different from the coaches world. A coachee could be going through a personal crises which shows up in many ways in his/her level of focus, energy and overall engagement. An expert coach will be mindful and use methods based on ‘Ontology’ and ‘Neuroscience’ to align and calibrate to the coachee. Coaching is a dance between the coach and the coachee, and being in sync with where the coachee is physically and emotionally garners far superior results for the coachee and eventually the sponsor organization. The skill of calibrating is immensely useful to know when and how much to nurture and stretch the coachee. Equally important is to have a great sense of own “Being” as a coach. 5. Holding your own and the coaching space: Coaching journeys by very nature have the potential to throw in a fair amount of challenges which may or may not be in the control of the coach and/or the coachee. Invariably there are scenarios in the duration of the journey which result in change of priorities, role, focus areas and many other pieces that perhaps are assumed during the start of the journey. As a coach it is necessary to respond to the volatility and uncertainty by seamlessly enabling the coachee to wade through while maintaining a high level of equilibrium and focus on achievable outcomes. 6. Cultural orientation and awareness: To be a world class coach and aim for mastery in todays VUCA environment, a coach should have a great sense of awareness about cultures he/she works with, along with their own orientation compared to similar dimensions in other cultures. Examples could be- Individual orientation Vs Group orientation, Hierarchical Vs Participative, Need for certainty Vs Tolerance for ambiguity, so on and so forth. This greater sense of awareness enables coaches to be conscious of their own biases and preferences and support coachees in understanding cultural orientation to leverage cultural diversity for the greater good of teams and organization. 7. Traveler, Explorer and Adventurous: Coachees look up to coaches who enrichen the coaching space by inspiring and stimulating anecdotal references through storytelling. A well-traveled coach with an experience of working with people from multiple cultures, and a spirit of exploration and adventure brings perspectives which a coachee can draw parallels to his/her current or future situation. Through real stories a coach is quickly able to establish credibility and trust. A spirit of exploration makes for generative and mentally stimulating conversations which result in greater commitment from the coachee. Over the years my personal goal has been to master the 7 vitals, which lend well to heightened client engagement and astounding ROI for the client organizations. Dr. 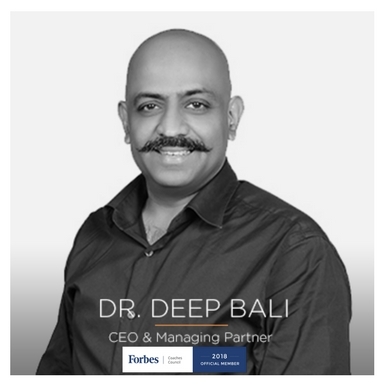 Deep Bali, CEO & Managing Partner, Recalibrate Pvt. Ltd. Deep is a Columbia University Global Leadership Coach, and is acknowledged by business leaders and CEOs across geographies for his super ability to enable leaders, teams and businesses to “Pivot”. The Confluence of Leadership Coaching And Technology Is Here To Stay. Here’s Why.